The trend of increasing the screen resolution has been replaced by that of changing the aspect ratio. LG started it with the G6, followed by Samsung and the next iPhone is rumored to sport a similar tall display resolution. LG recently announced a new mid-range device with 18:9 display ratio. Now the latest company to join the bandwagon is Micromax. After a brief hiatus from mobile manufacturing, they are planning to relaunch their Canvas series, now with a series called Canvas Infinity. The Canvas series initially offered some good value for money products. It ensured that Micromax got enough market share in India. Then the entry of Chinese players such as Xiaomi, Lenovo and others toppled Micromax from their position as market leaders. They tried to bring out a subsidiary called Yu, which again didn't stand a chance in front of the Chinese giants. Eventually, Micromax lost almost 50% of their market share within one year. Now, the company is all set to launch a premium phone on 22nd of August. They have started sending out invites with a message - 'Block Your Date'. 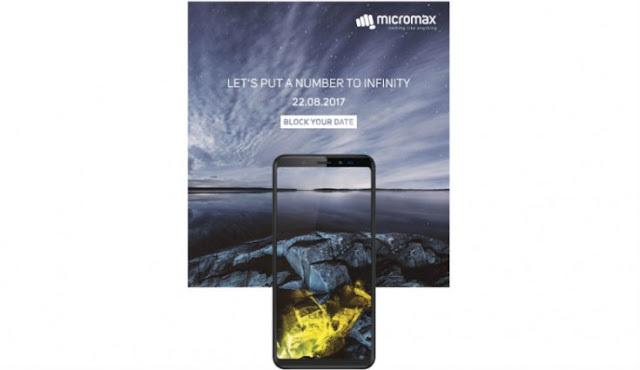 The tag line on the invite says 'Let's put a number to Infinity', which indicates that the phone will be named Canvas Infinity. Micromax had recently revealed that their upcoming phone will have a 5.7 inch display with 18:9 ratio. The highlight of the invite is an image of the front side of the phone, which clearly shows a tall display, thereby leaving too little for imagination. The phones having such displays are Samsung Galaxy S8/S8+, LG G6 and Q6. While Q6 costs Rs. 14,999, S8/S8+ and LG G6 are premium handsets with prices higher than Rs 35,000. If Micromax price their new smartphones aggressively, it might turn the fortunes for the Indian company. But given the track record of poorly executed hardware, we are skeptical about its success.